This book was similar to the Hunger Games and Divergent series in that the story takes place after a huge war that causes wide scale destruction in The United States of America. However, I found this book to be more appealing since it doesn’t have as much gore and violence. When the United States of America is destroyed, a new world called Illea is created. A world with new rules, new rulers, and no democracy. The people of this nation are divided into castes- there are Ones, which are highest class and consist of the royal family and their descendants; there are Twos, who still live in luxury, just not in the palace; there are Threes, who are a little less fortunate than the Twos, and so on. America is a Five. To her, caste means nothing, but it still defines her. Since America and her family are Fives, they have just enough food to sustain themselves, and everyone in their household has a job to do, no matter how small. Everybody pitches in to make ends meet. That’s just what being a Five is like. Then there is the Selection. The Selection is a tradition of Illea that dates back many decades. 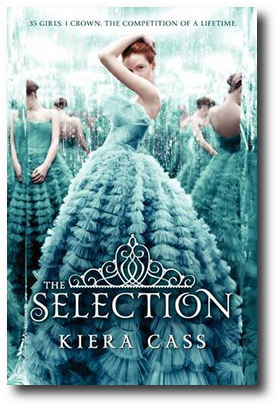 The Selection is basically a competition between all eligible girls in Illea to be the future kings’ wife. The girls go through rounds of testing and are judged to see who may adapt the best to royal life. America is bribed to participate in the Selection by her mother but to do so, she must give up her secret love, Aspen, who is a six. When America arrives at the palace, she is by far the lowest ranked but she somehow catches the Prince’s eye. America approaches the Prince, Prince Maxon, and makes it very clear that she doesn’t want to marry him. However, she says that Maxon looks like he might need a friend and she would gladly be his friend if he would let her be in the competition, since America’s family is paid money as long as she is in the competition. The Prince obliges and the two of them form an alliance of sorts. Many of the girls are eliminated in the first few days but America is chosen to be in the top six as the Prince has secretly fallen in love with her. She is now part of the Elite. Will she end up marrying the prince?